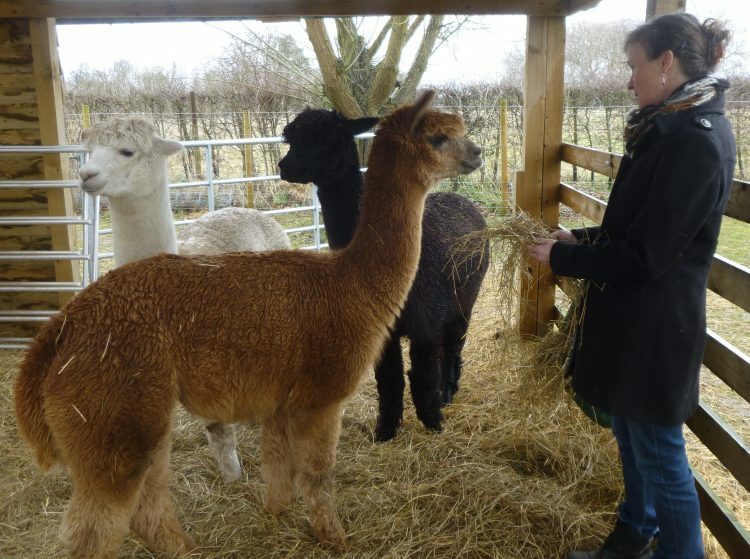 Yesterday morning I had a lovely visit to Great Waldringfield to meet Clare Kiely and her three beautiful alpacas – white Clement, black Fergus and ginger brown Norman. We went straight out to their stable in the field, and Clare gave me a big handful of hay to feed them. 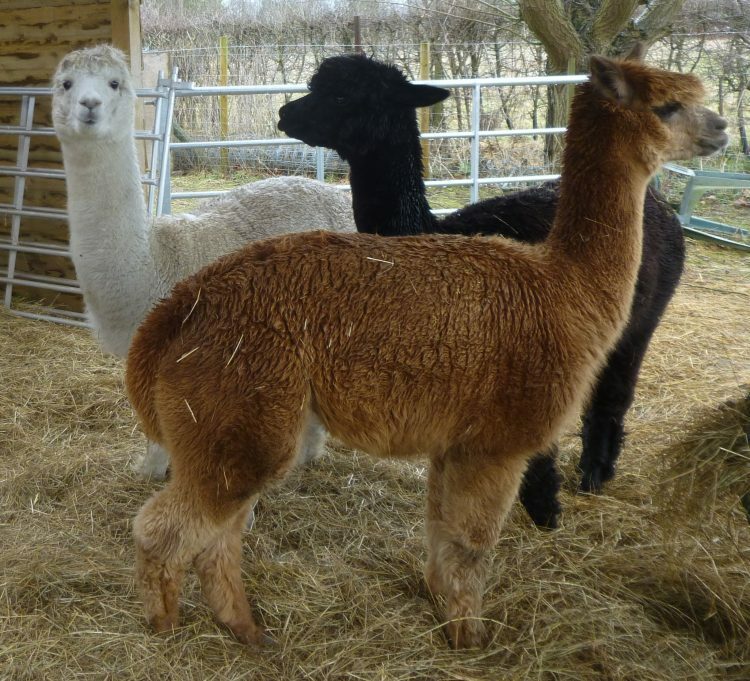 They are quite timid, but were soon tugging at the hay, and selecting the particular grasses they liked best! They have beautiful big eyes, and velvety noses, and their fleece looks very thick and soft. 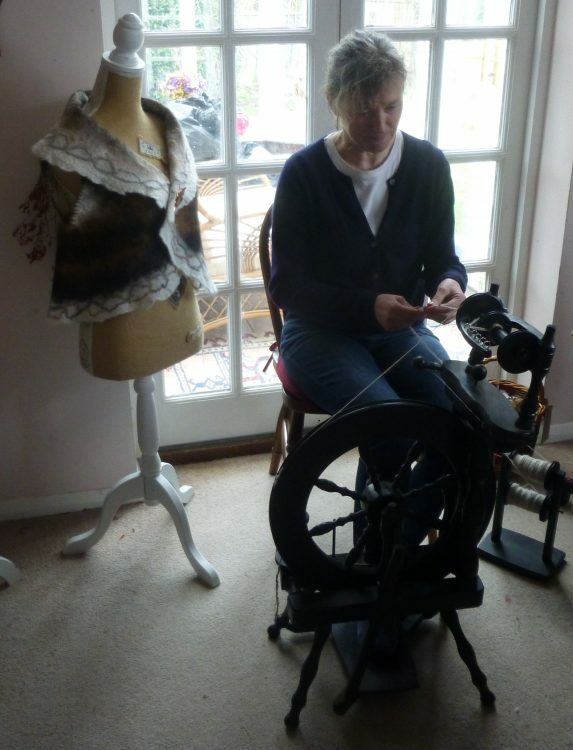 Back inside, Clare showed me how she cards the fleece, to get the fibres running in the same direction. The carded wool is unbelievably soft and silky to touch – it really is a luxury yarn! If she is felting with it, Clare will then use the carded fleece to lay down into the shapes she wants to form a range of felt items – vases, bowls, wall hangings, bags, bottle coolers, and spectacular waistcoats. For weaving, Clare spins the wool on her spinning wheel, and then plies two strands together using a gadget on top of the wheel. The wool can then be woven on card looms, and Clare has devised a method of weaving cushion covers ‘in the round’, so they have no seams at the sides or the bottom, just a fold-in flap at the top. She also weaves small bags and purses, phone cases, and tiny cushions filled with dried lavender from her garden. Clare runs course on felting at her home and at other venues – we will have leaflets about these available at the Festival. I know that the lovely unusual items which Clare makes are going to be a great hit with our visitors! 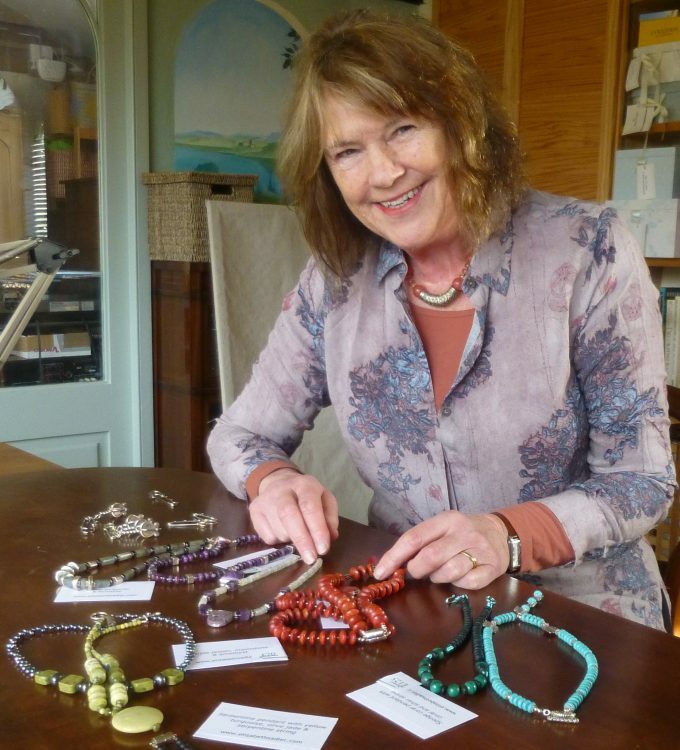 On Friday I drove up to the village of Walsham le Willows near Bury St Edmunds to visit jeweller Alison Dane. It is a very pretty rural area, and Alison lives in a lovely thatched cottage dating from the mid 1700s. From her back garden there wasn’t another building in sight. Alison is in the middle of having a studio re-fit, so we had a dining room table meeting! 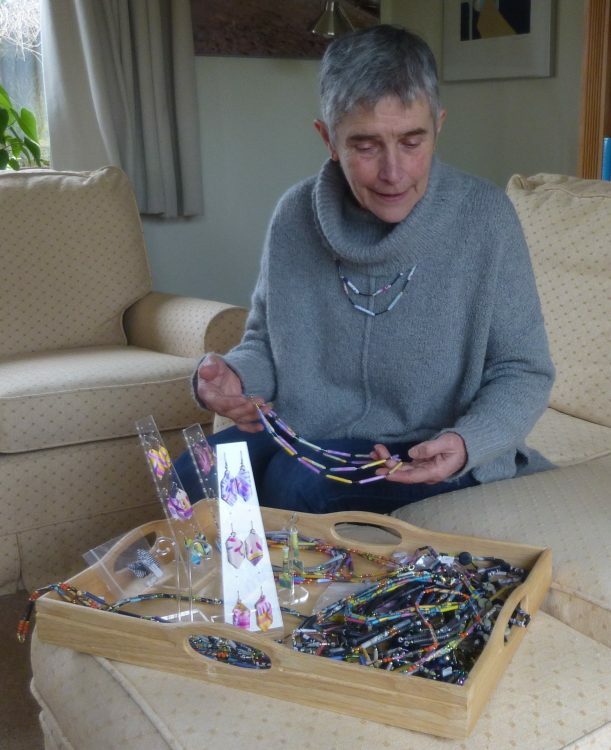 A former art teacher, she has a most intriguing way of making her wonderfully colourful jewellery. She starts by preparing sheets of thin paper by a mixture of printing, stencilling and painting. The paper is cut into strips, the width of the finished bead length. Using a PVA based adhesive the strips are wound tightly round a metal rod such as a thin knitting needle. When they are dry they are completely hard and have a varnished appearance. Alison then assembles them, with other beads to form necklaces, and ear-rings. She also uses other methods of shaping paper to produce wave shaped ear-rings and other items. The results are amazingly light, but strong and wonderfully colourful. 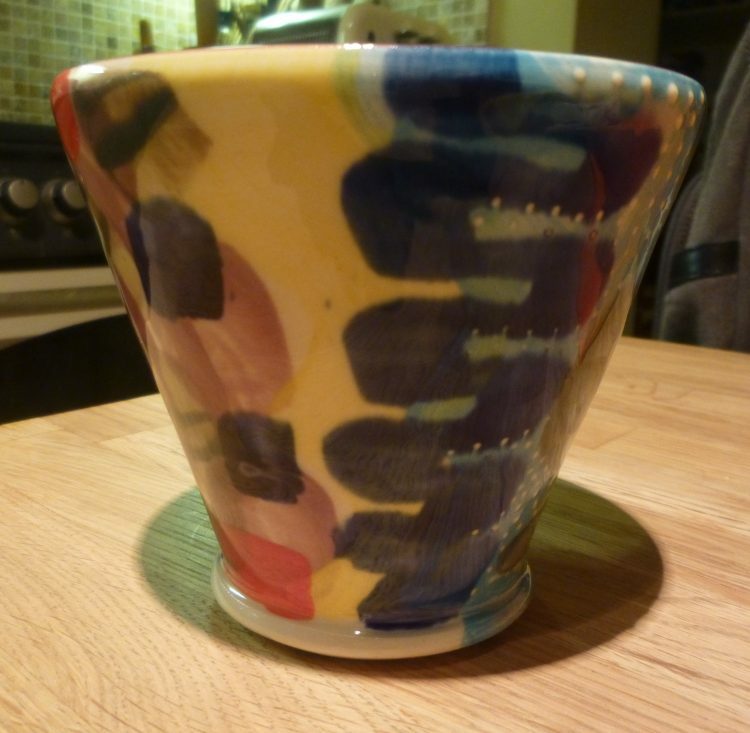 She has a real gift for combining colour and pattern. The photo shows Alison with a tray piled up with her beautiful work, which I’m sure is going to be a hit with our Festival visitors. 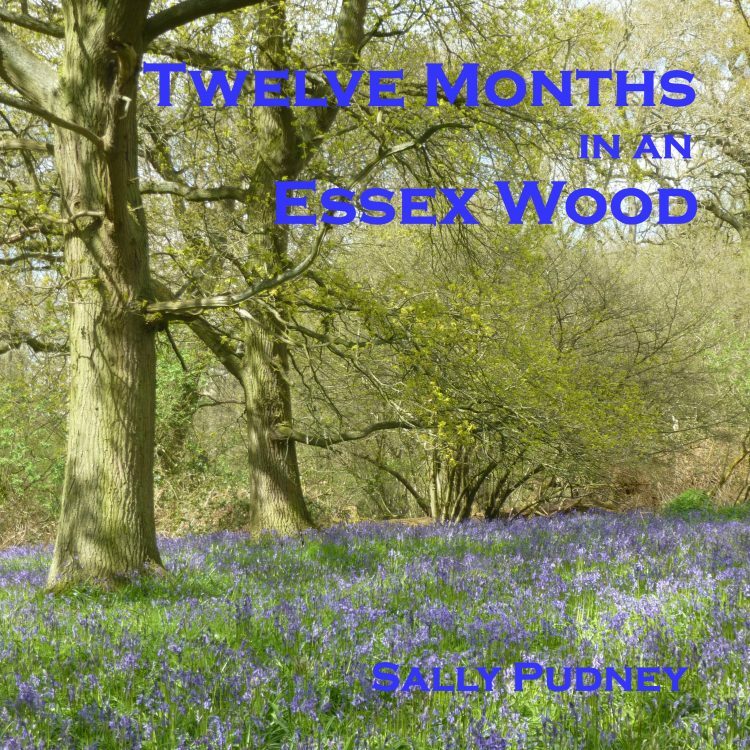 Alison does not have a website, but is a full member of the Suffolk Craft Society and has an online presence on their site. 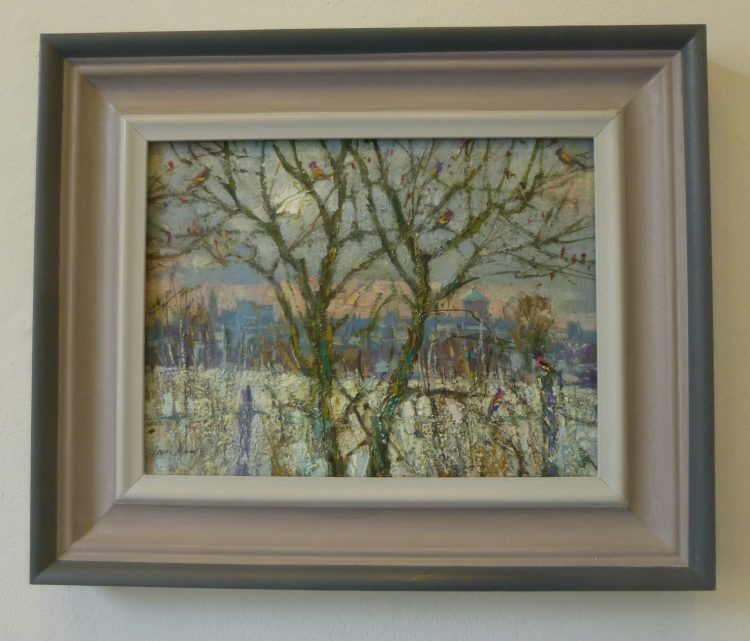 Last Thursday – the day of Storm Doris – Graham and I went down to Maldon to catch the Barbara Rae exhibition at the Haylett’s Gallery before it closed on Saturday. It was well worth the trip. The colours were just amazing. 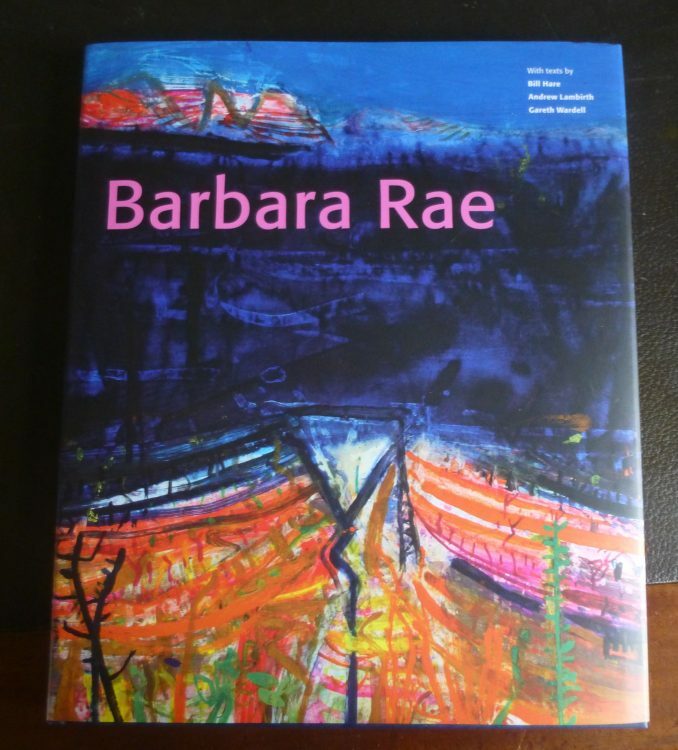 I couldn’t resist buying the book, which has a very interesting interview transcript as well as being packed with great colour reproductions of Barbara Rae’s paintings. 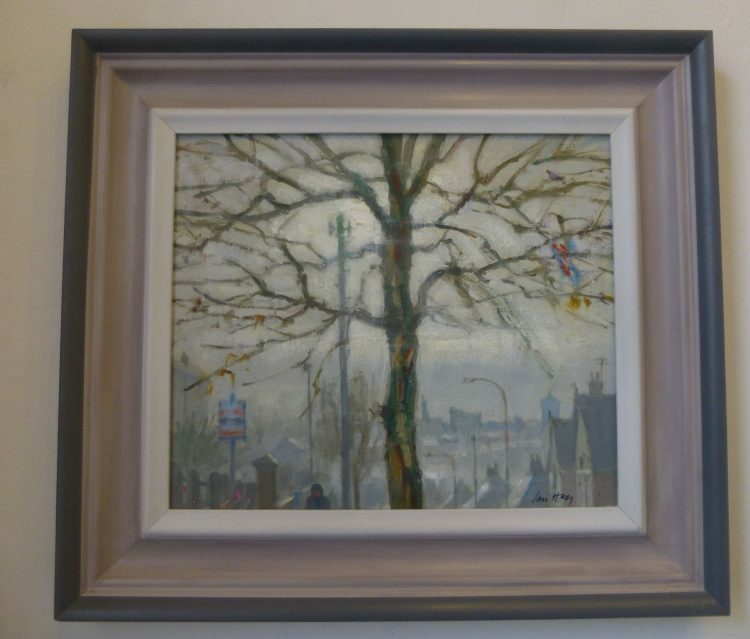 This is one of her paintings which I liked at the Royal Academy Summer Exhibition last year. After we left the Haylett’s Gallery we drove the short distance to Heybridge Basin. Storm Doris was really blowing up by now. I had the mad idea to walk along the sea wall to see if there were any good dinghies. 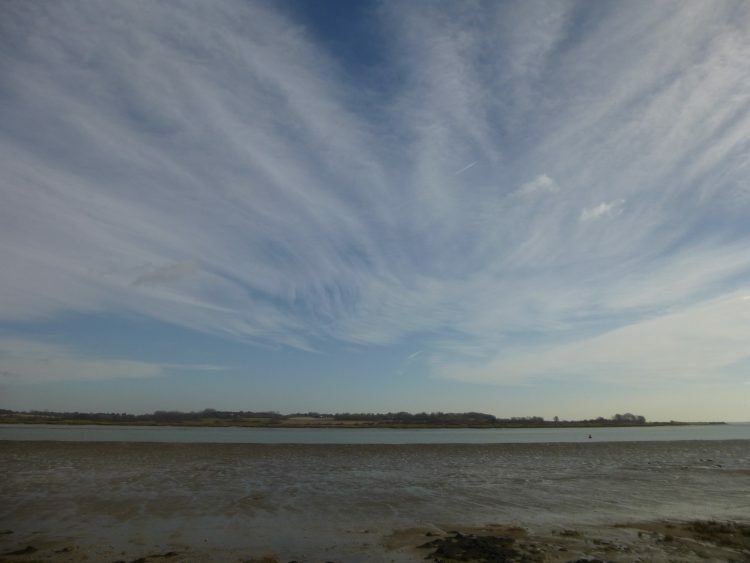 Needless to say there was scarcely a dinghy to be seen, but for the first time I saw white topped waves on the estuary! The wind was so strong we were in danger of being blown over in that absolutely exposed place, so we didn’t get very far! We walked back hanging on to each other to stay upright – and beat a retreat into The Jolly Sailor for a very welcome lunch. 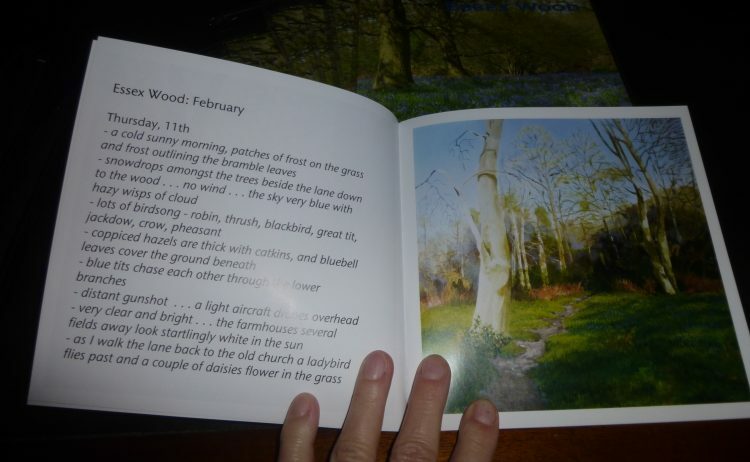 Yesterday afternoon I made a start on Fingringhoe Wick: February. 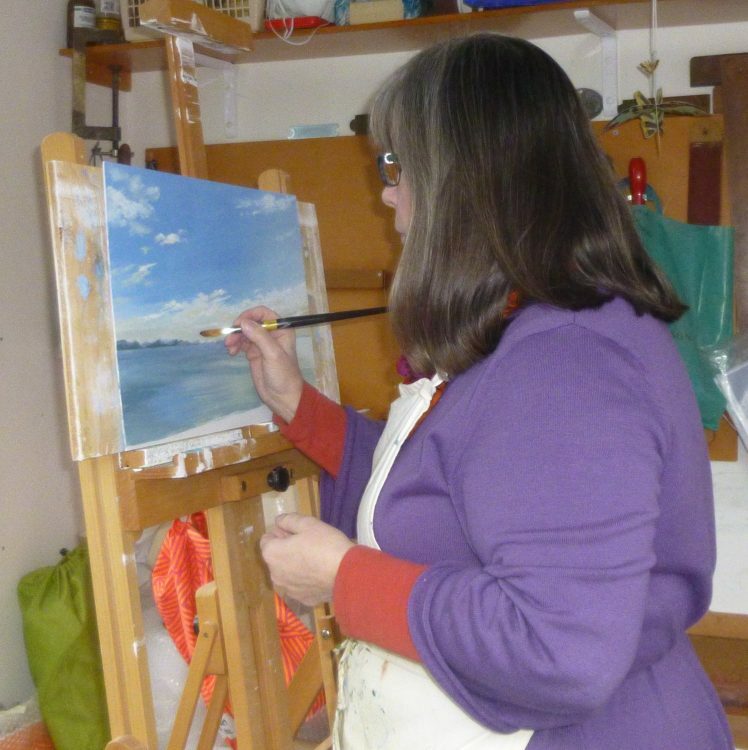 It was so warm that I was painting with the studio door open! For the first time this year!! The birds were all singing and it felt really spring like. I haven’t got very far yet as you can see. A bit of drawing to place the main features, and some ‘background’ sky colour. 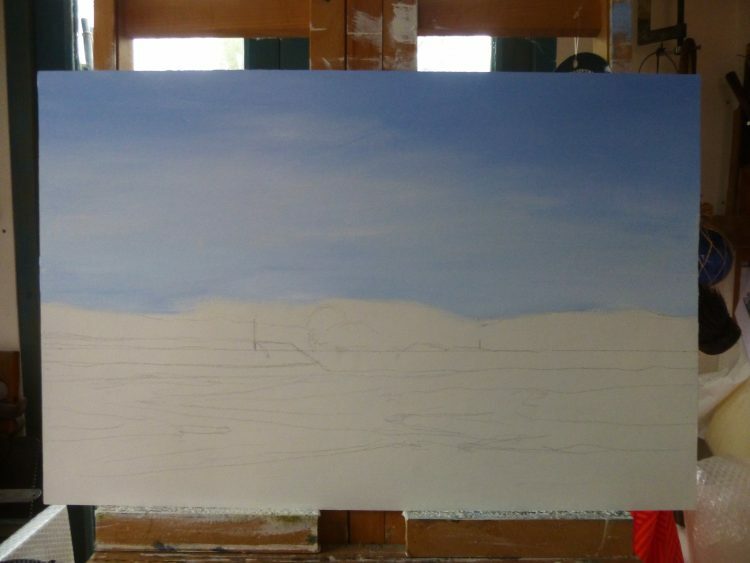 Some interesting clouds will be going over this, but I find it works best to paint the sky in layers. It is still very mild today, but very windy, and some huge black clouds towering up to the north, so I guess I will be working this afternoon with the door shut! On Friday I drove up to the village of Ickleton in rural Cambridgeshire. 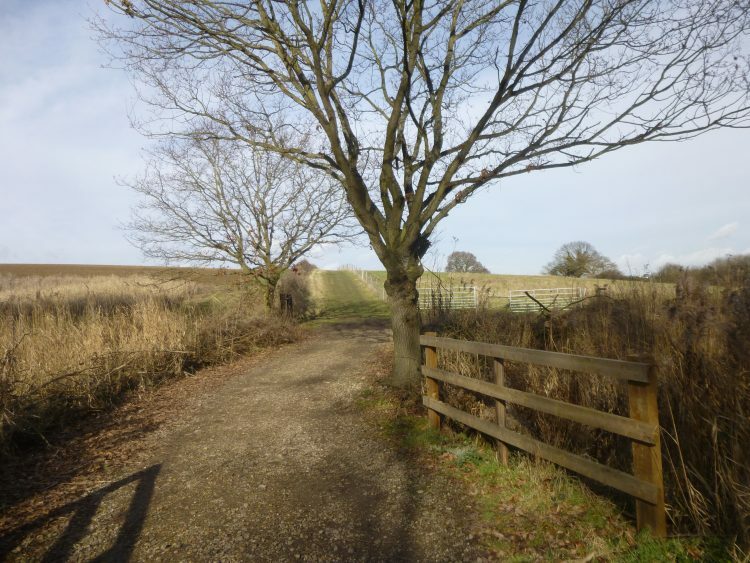 Although it is quite near the top of the M11 it is a lovely, peaceful area, with the river Cam winding along beside the road as I drove along to the home of Colin and Rosemary Hayes. Their house is timber framed and lovely, the oldest parts dating from the 1400s. I was welcomed at the door by Colin, and Ruby, their very friendly black Labrador! Colin has a large studio in the garden, which stretches down to ancient meadowlands. 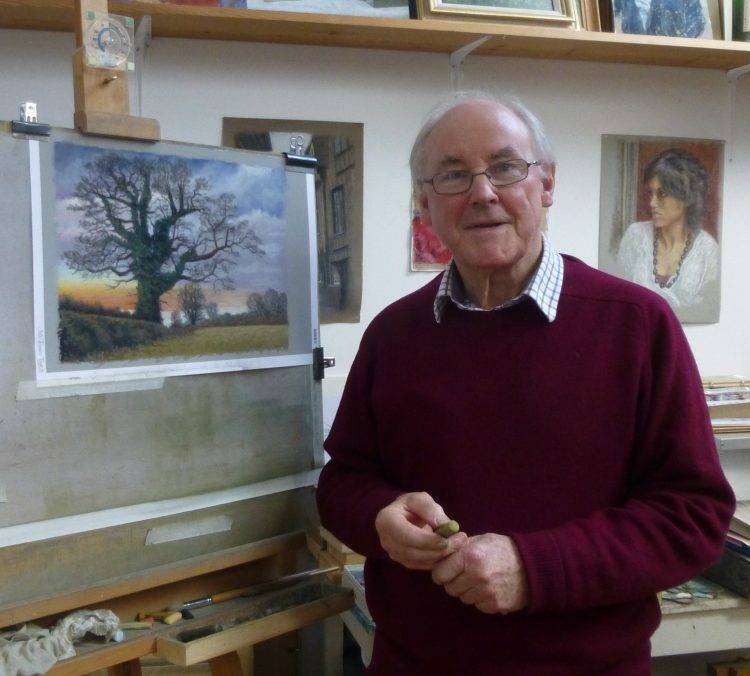 He will be exhibiting his pastel landscapes at Lexden Arts Festival for the first time this year. He started working in pastels ten years before he retired from his ‘day job’, as a director of Cambridge University Press. Since then he has twice had his work accepted for exhibition by the prestigious Royal Society of British Artists. 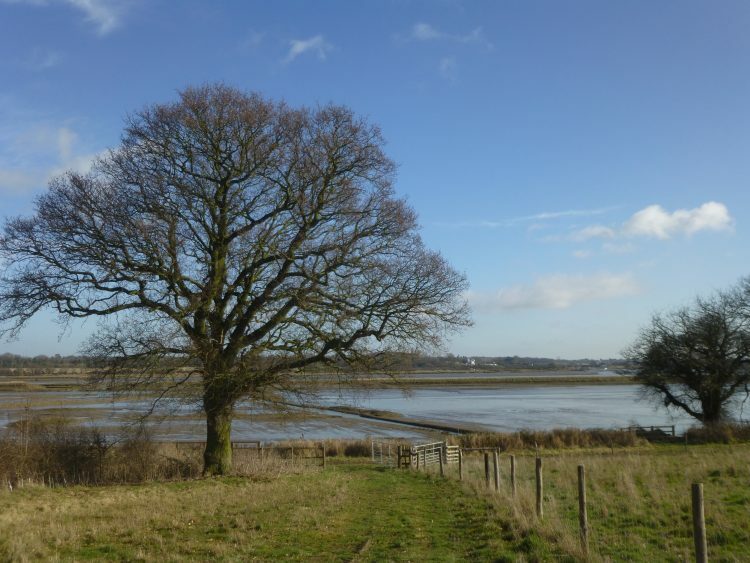 He has a love for the rural landscapes of East Anglia, those locally around his home, and further afield in the Fens, and the North Norfolk Coast. We spent some time in the studio, going through all the work which Colin had sorted out to show in Lexden. 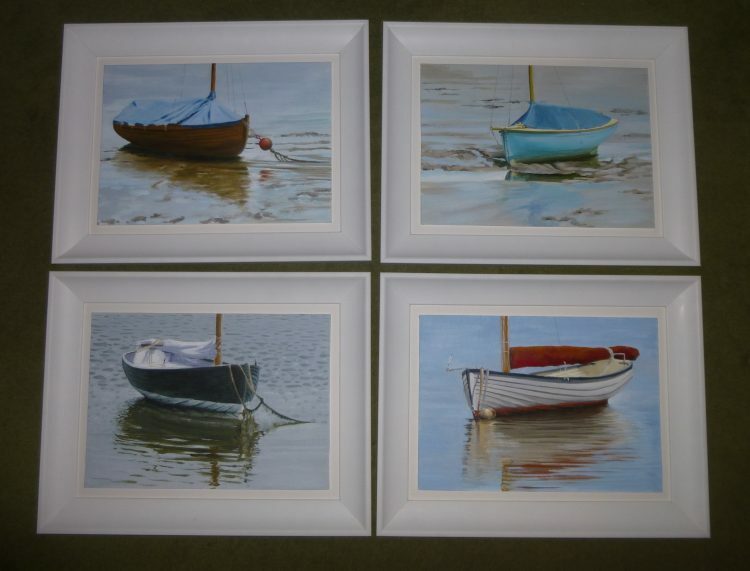 He will also have unframed giclee prints in our print browser, and probably greetings cards of his work, too. 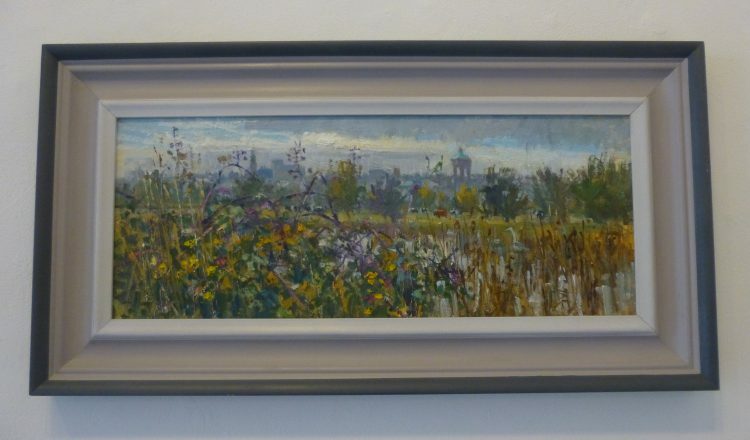 We have never had a pastel artist exhibiting at the Festival, and I’m sure our visitors are going to enjoy Colin’s work. Colin and his wife had very kindly invited me to stay for lunch. 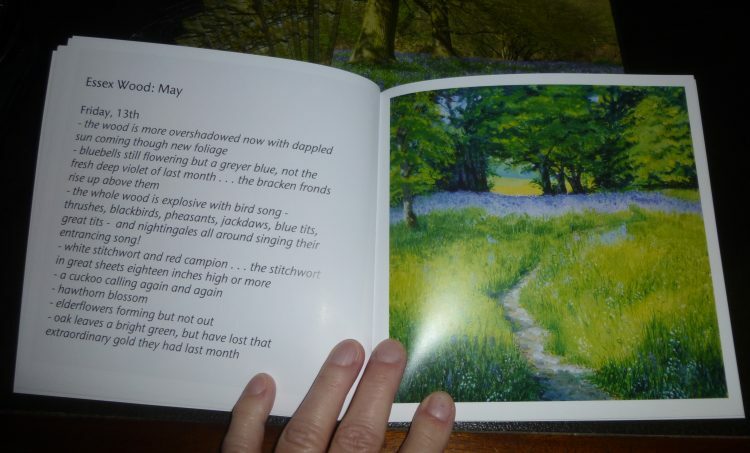 Rosemary is an author of around 40 books for children and teenagers – what a creative household! I nearly made my February visit to Fingringhoe Wick earlier this week. How glad I am that I left it till today. The morning was perfect. 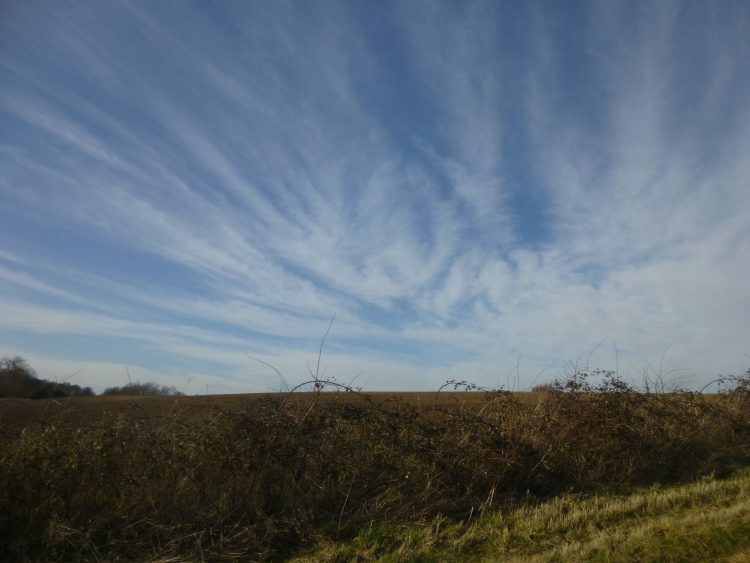 Sunny, mild, a little breeze, blue sky with interesting clouds. Actually very interesting clouds – here are a few . . .
– before landing again where they had been. There must have been about four hundred. The photo only caught a small group of them! A man I spoke to said he thought a peregrine may have spooked them, but we couldn’t see it. 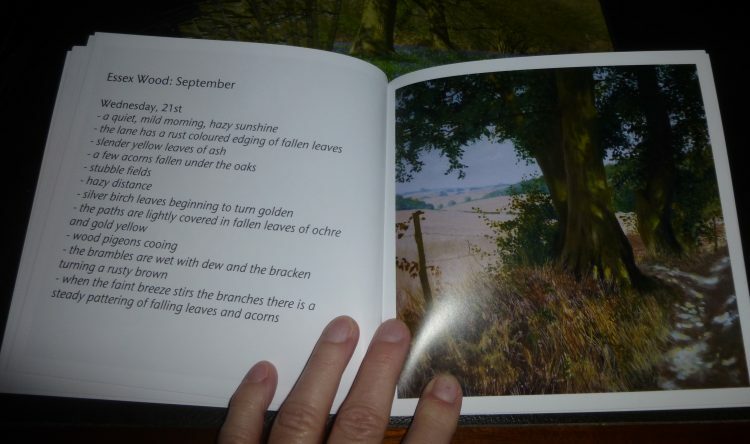 This month I walked straight along the main track to Margaret’s Hide where I spent quite a while drawing. 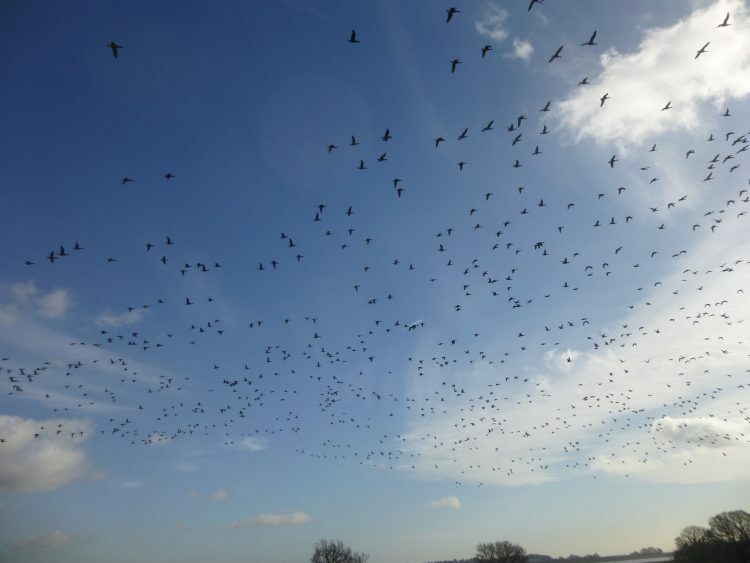 Then on to Robbie’s Hide, where I saw a huge flock of birds circling – yet to be identified! 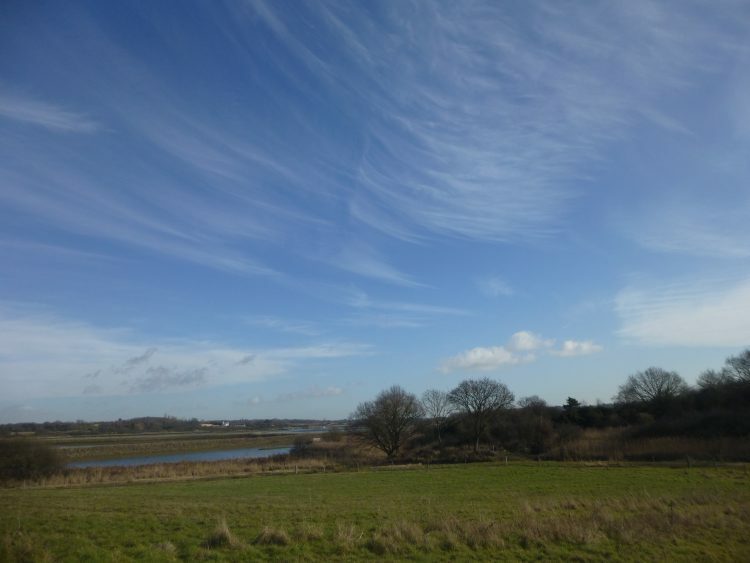 The non-watery bits of the reserve were looking very peaceful in the sunshine. 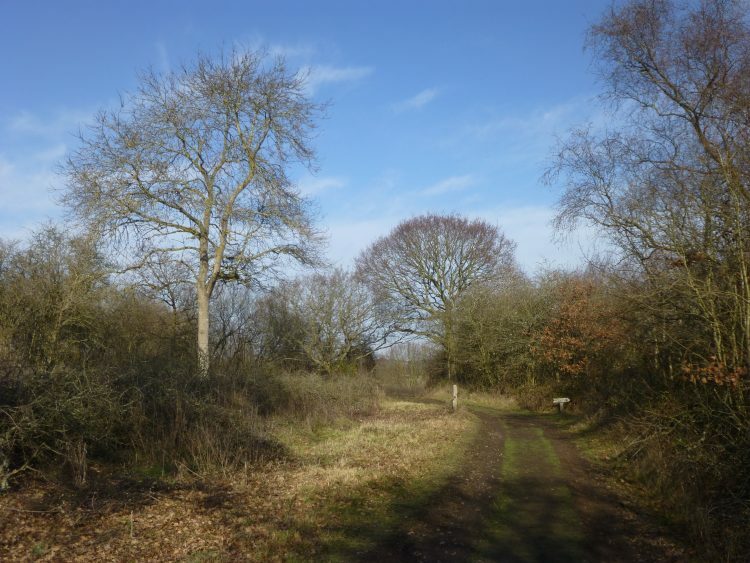 The Reserve is just full of good painting subjects – I can see I shall have no difficulty finding twelve! I know exactly what I shall paint for this month. I finished my visit off with some tea and cake in the visitor’s centre. And when I got home I chose a painting board the right size for the subject, and gave it a first coat of primer! Since I got back I have done a bit of research – talking to my sister, who is a good ‘birder’, and looking on the RSPB’s website. The huge flock of circling birds I am now pretty sure were avocets. And what I thought was a hobby was actually a merlin! On Monday afternoon Graham and I went over to Felixstowe to visit Naomi Brangwyn. 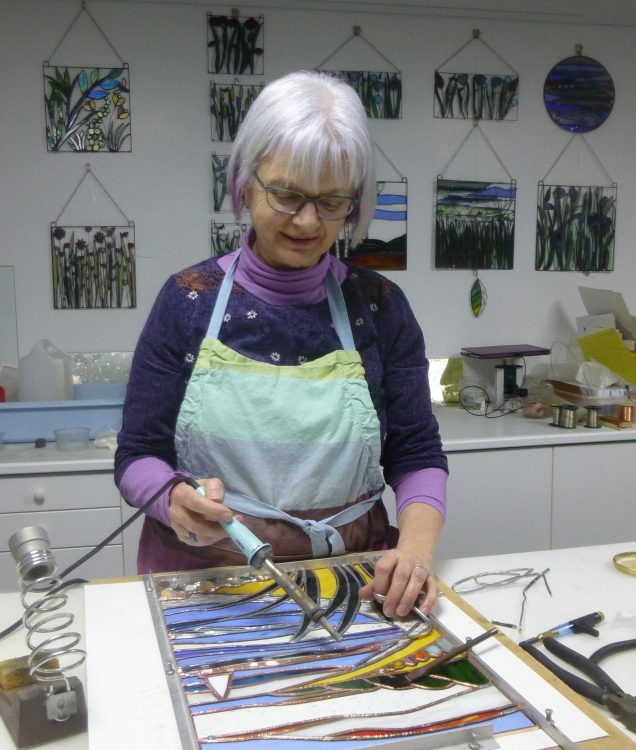 Naomi creates stained glass works from coloured glass and all sorts of interesting additions – stones, shells, bits of driftwood . . . Ideally her hangings are seen against a plain white wall, although some can be viewed hanging in a window, with the light behind. Naomi showed us how she first cuts the coloured glass to size and lays it out to consider the design and make any necessary adjustments. The edges of the glass are then covered with a self adhesive copper foil, and the copper edgings are soldered together. The solder is a silver colour, but can be treated in acid to turn it black, to give the traditional ‘leaded’ appearance that is usually seen in stained glass. In the photo Naomi is in the process of soldering sections of glass together on a commissioned piece. Behind her, on the wall, some of her finished glass works can be seen. 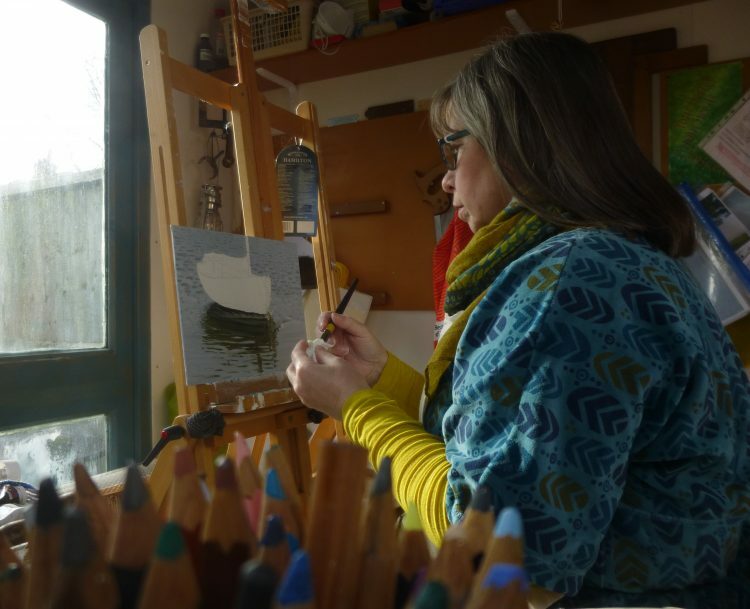 Naomi runs workshops both in her own studio for small groups of six, and in other venues, for anyone who wants to try this fascinating medium for themselves. This is the first time we have featured a glass artist at the Festival, and I am sure her work is going to be very popular with our visitors. So, here’s the first painting in my 2017 project, A Year on Fingringhoe Wick. 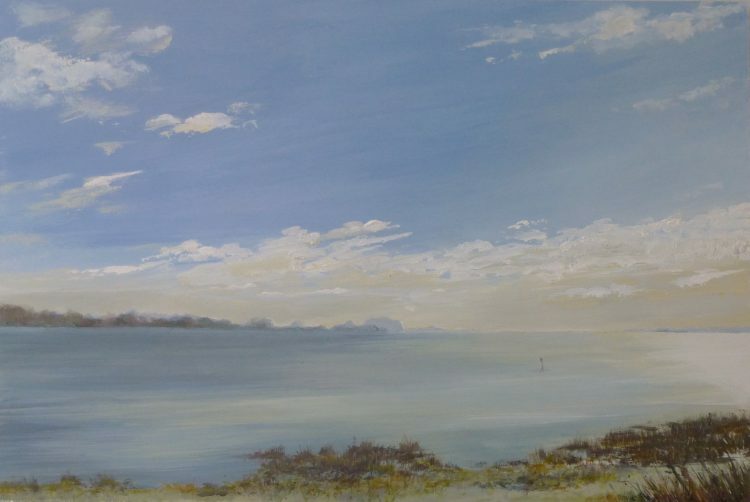 This is the view looking down the Colne Estuary out to sea, with Alresford on the opposite bank, and Mersea Island just visible in the distance on the right hand horizon. I’m hoping to do my February visit sometime this week, which is turning out to be really sunny fine weather. This is the month when I start travelling all over East Anglia visiting the artists and makers who will be exhibiting at this year’s Lexden Arts Festival. On Wednesday, Graham and I went down to Brightlingsea to visit Barry Woodcock, a wood engraver. 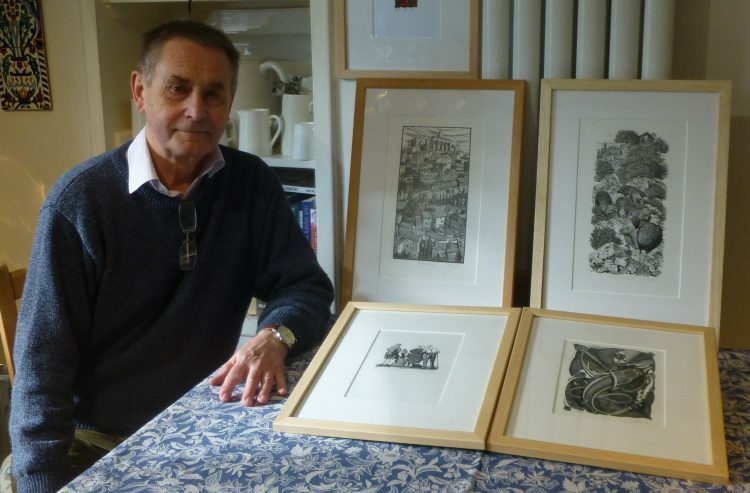 Barry is an elected member of the prestigious Society of Wood Engravers with whom he has exhibited regularly since 2003. After studying fine art at Ipswich School of Art, he worked in the world of advertising as an artist/visualiser, before taking a post as a in-house graphic designer at Essex University. During this time he was continuing to work on his own fine art work. In 1996 he left full time employment to concentrate on his wood engraving. His work has been exhibited throughout the UK, including at the Royal Academy’s Summer Exhibition. We had coffee with Barry in his kitchen, and we really enjoyed looking through a portfolio of his work, while he told us a little about the technique. He uses lemon wood – not the wood from a lemon tree, but a tropical hard wood – to engrave with his wonderfully intricate designs, before the blocks are printed in editions of 75 or 100. We particularly liked the engravings of local river scenes, and of tropical fish and birds. Barry will have framed and unframed work in our show, and I am confident that it will be popular with our Festival visitors. This afternoon I finished off Blackwater Reflections III. This is the fourth painting bound for the Geedon Gallery’s Spring Exhibition. She is another Heybridge Basin sailing dinghy which I found in the autumn, and she is an unusual colour, a very dark green with a white bottom! 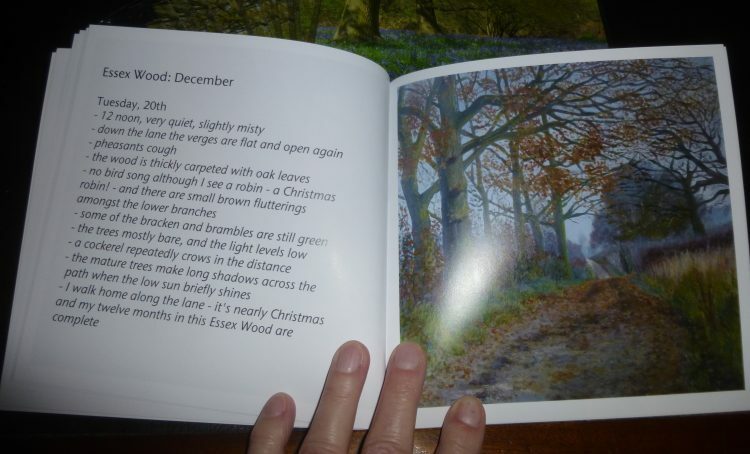 Now it’s onto the first of the Fingringhoe Wick paintings – ‘January’! So I’m still a bit behind, but I’m not worried, it will all get done eventually. Well, it’s been a busy weekend! Up to Snape Maltings on the Suffolk coast on Saturday night for a great concert in the Britten Studio. The first 45 minutes was The Young ‘Uns – a three part male singing trio. They perform in a folk style, but most of the songs were written by them, many about issues of social justice and about ‘heroes’ of the group. The second 45 minutes featured ‘Leveret’ – another trio, this time instrumental, with amazing fiddler Sam Sweeney, Andy Cutting on accordeons and melodeon, and Rob Harbron on concertina. 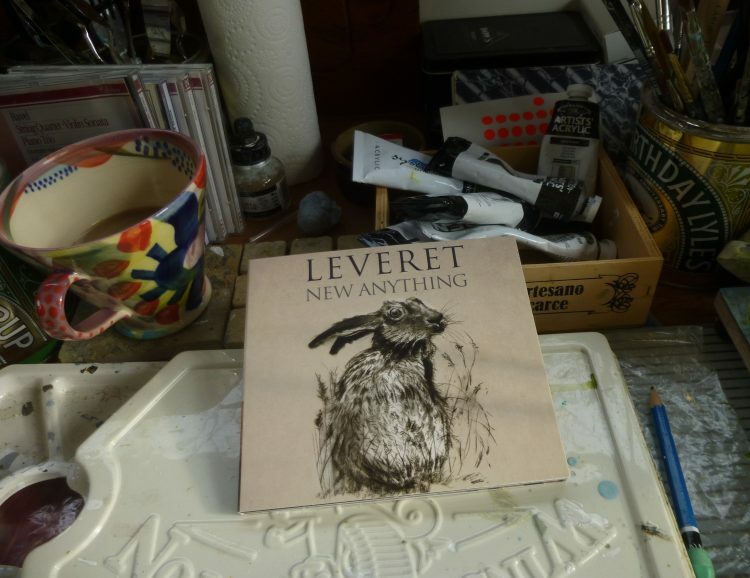 We enjoyed it all – Graham liked The Young ‘Uns best, and I particularly enjoyed Leveret – I bought two of their CDs and am looking forward to listening! 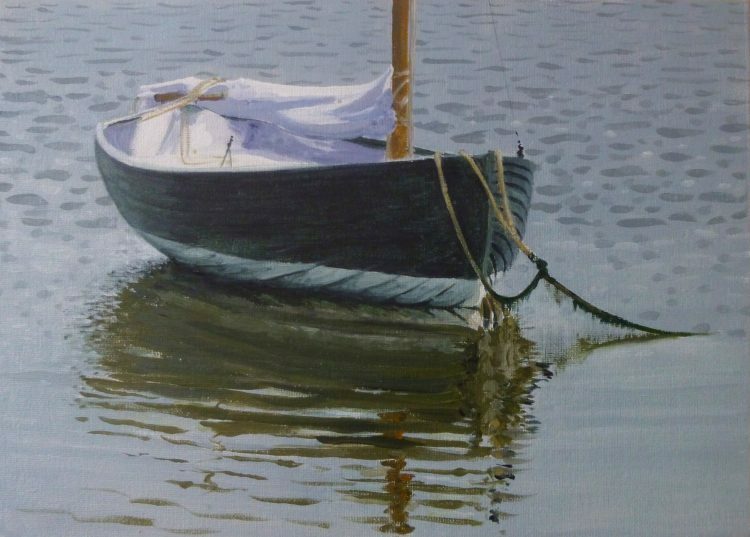 A Sunday morning spent in my studio working on the fourth dinghy for the Geedon Gallery, then this afternoon we went down to Wivenhoe to see the Sentinel Gallery’s first show of the year – ‘Seen in Wivenhoe’. 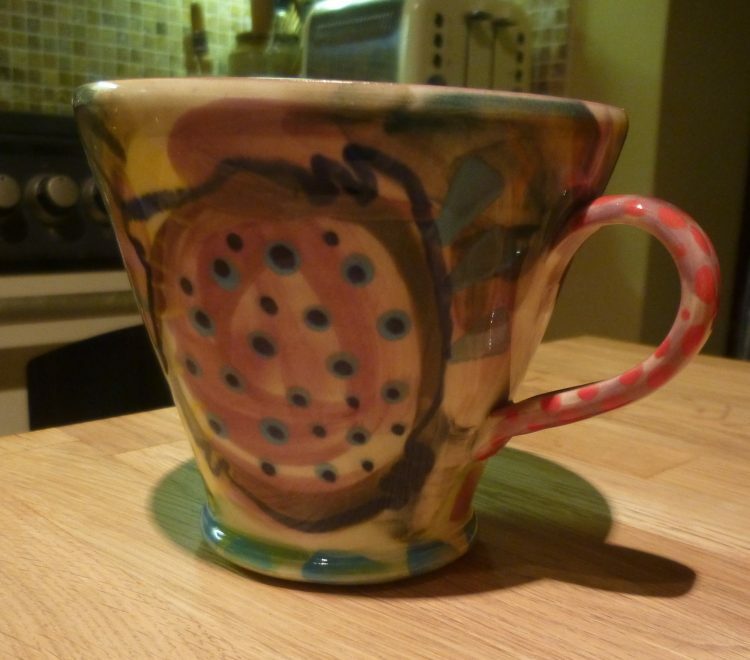 We both really liked the colourful watercolours of David Miller, and we both bought a mug! Graham bought one of Rosie’s and I bought one of Pru’s – to add to my growing collection! Here is it . . . The photos don’t really do justice to the lovely vibrant colours . . . We rounded off the afternoon with a walk on the beach at Holland on Sea. 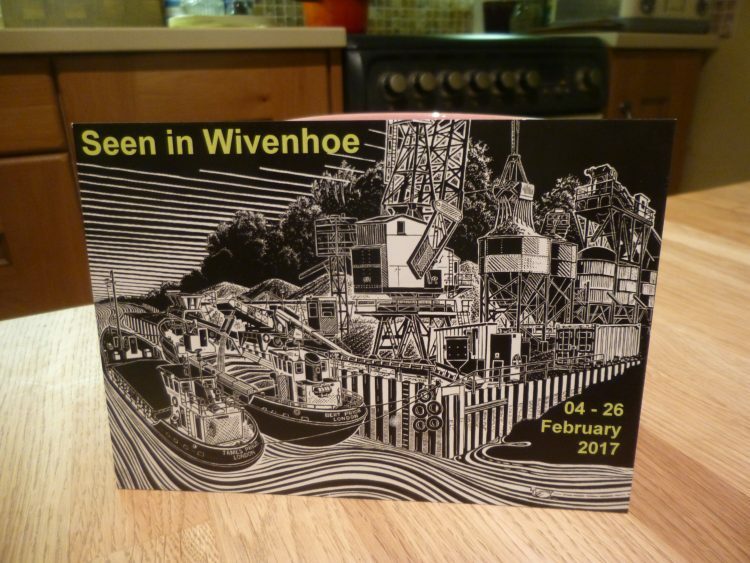 ‘Seen in Wivenhoe’ is a really good mixed show. Well worth a trip to Wivenhoe if you are in the area. 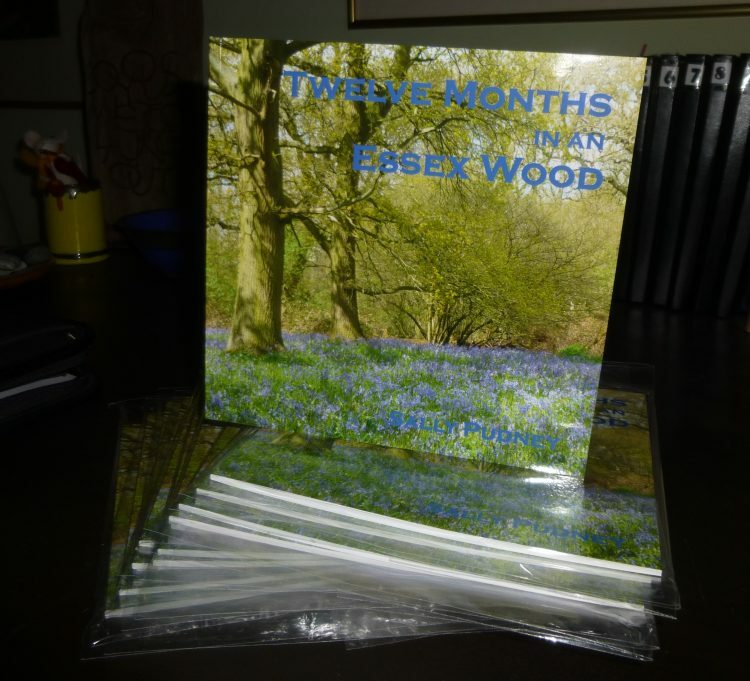 A few days ago I ordered my ‘Twelve Months in an Essex Wood’ books! I designed them online with www.blurb.com, which is a very easy to use site. I am very excited to see the finished books – and I’m hoping they may come this week. Here is a little preview of the cover. 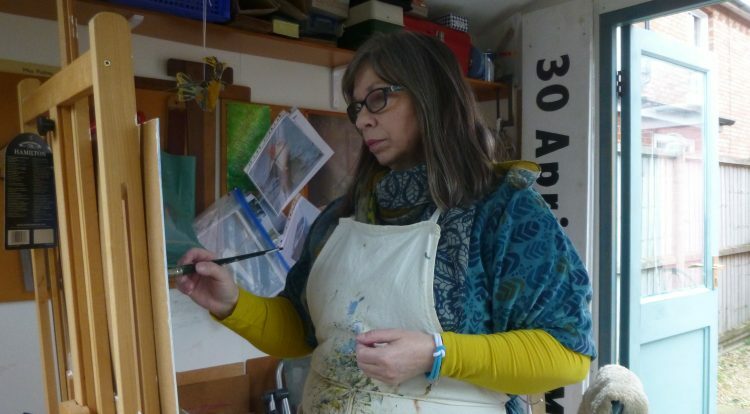 And it’s a busy week ahead, too, because this is the week that I start visiting all the artists who will be showing with us at the Lexden Arts Festival – I always really enjoy meeting them and talking to them about their work. I will post a little bit about each one after I’ve visited them. 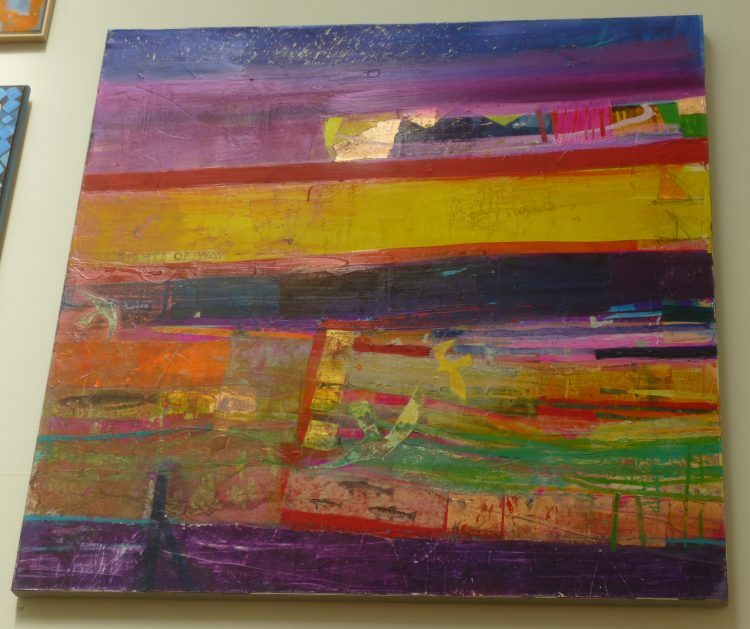 If you live anywhere in the Colchester area, you might like to take a look at the Festival website – www.lexdenartsfestival.org.uk – as we have some exciting events taking place during the week, as well as what I think will be an excellent art exhibition.